Home » EOG Resources is a Quality Stock, But is it Time to Buy? EOG Resources is a Quality Stock, But is it Time to Buy? The shares of EOG Resources increased by 56% over the past year and 233% over the past five years. EOG is a high-quality oil shale play but with its rise, has it played out or is it still a good way to invest in the sector. It is flirting with breaking its 52-week high and the company will report its 2Q earnings on August 2. EOG Resources explores, develops, and produces crude oil and natural gas largely in the United States, Canada, Trinidad and Tobago, the UK, China, and Argentina. Its core business is the production of shale oil, non-condensate and natural gas liquids (NGLs) in the United States. 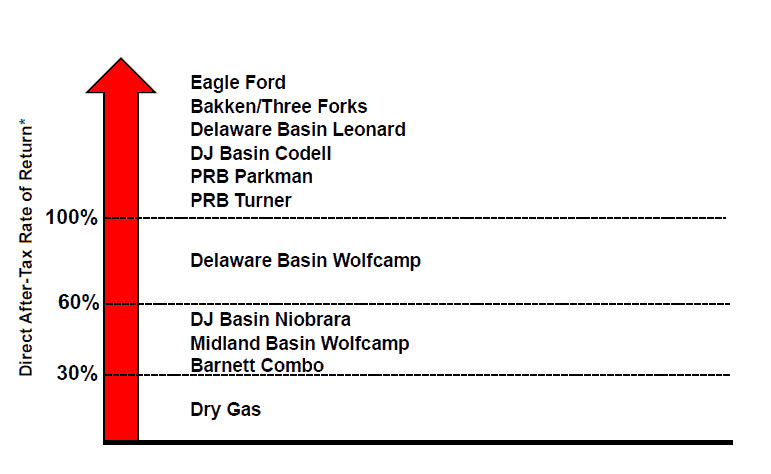 The company’s primary assets are in Eagle Ford, Bakken/Three Forks, and Permian Basins. 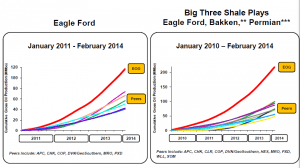 EOG is the largest producer and leaseholder in Eagle Ford, a leader in Bakken, and improving its position in the Permian Basin. Oil production has growth at a 40% CAGR since 2011. It is different than other firms like Chesapeake Energy (NYSE: CHK) and Devon Energy (NYSE: DVN). Chesapeake and Devon both have broader exposure to both oil and natural gas. Since the shale boom started, natural gas prices have fluctuated and at times fallen below price levels due to excess supply. While oil supply and reserves have also increased, the pricing for oil and other liquids has remained more stable and more profitable. This has led to industry leading returns for EOG and good stock performance. Chesapeake’s and Devon’s shares are up just 32% and 40%, relatively, over the past five years compared to EOG, which is up 233%. EOG’s ROE and ROCE both lead its peer group (see above charts). It has greater flexibility in moving product to market through its wholly owned crude-by-rail infrastructure. In addition, it owns the sand it needs to use which cut its completion costs versus competitors. It also cuts operating costs or the cost per barrel. Management notes that its focus on exploration helps regenerate drilling inventory and adds new plays. 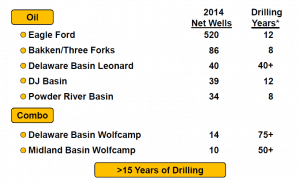 In 2014, it added roughly 10 years of high-return drilling inventory in the DJ and Powder River Basins. 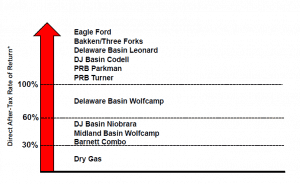 It also increased Eagle Ford Reserves by 45% to 4.2 BnBoe. EOG’s 1Q14 results show why it is a leader. FY Oil growth was up 29%, non-GAAP EPS was up 56% and discretionary cash flow as up 28%. 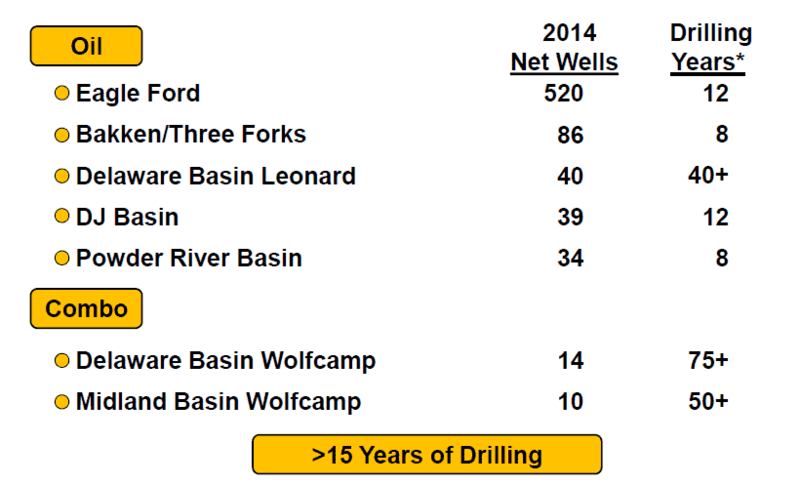 EOG Resources 2014 plans include target of 29% crude oil growth and 12% total production growth. Its capital spend will focus on high ATROR oil plays, see following diagram, and it also plans to improve recovery and the rate of return on its existing plays. Management will continue to look for green field oil and combo plays. It will fund all capex from discretionary cash flows and also reduce net debt via FCF. For 2015+, management indicated plans to grow the dividend, increase capex for E&P activity and grow the portfolio of liquids inventory, and further reduce debt. The current net debt to total cap ratio is just 21%. It already increased the dividend by 33% in 2014 to $0.50 per share. The growth in oil production in the US has almost entirely resulted from increased production out of Eagle Ford and Bakken shale. However, the growth rates appear to be slowing slightly. The concern is that lower growth rates will carry over to EOG and its ability to grow earnings will also be impacted. EOG has outperformed the market in the past, see the following charts. While it should continue to outpace its peers, EOG also has a deep inventory of other crude assets to develop and maintain a high growth rate. The following is a list management provided in early June of current assets. Based on those assets, management forecasts 2015-2015 growth will continue in the double-digits in crude and NGLs. There is potential for that to accelerate. 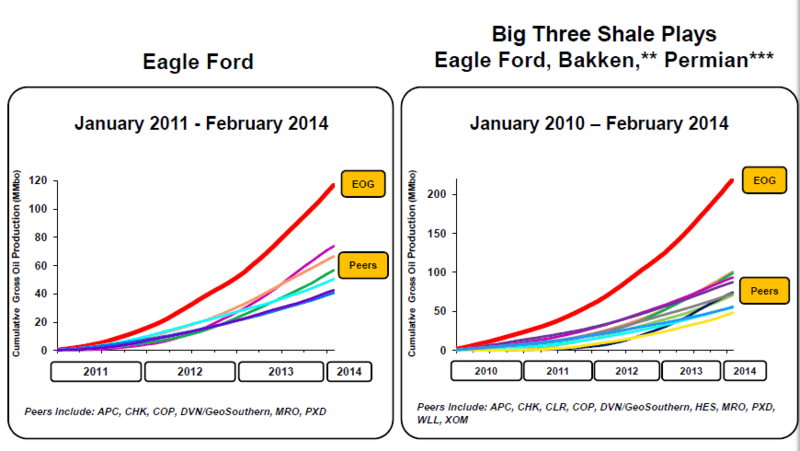 EOG has the highest organic crude oil growth rate of all large cap E&P peers since 2010. EOG’s growth rates and returns establish it as an industry leader but does the valuation already reflect this. EOG shares trade in line with the industry average EV/EBITDA. It is arguable that EOG should trade at a premium given its above average growth rates and metrics. EOG is a solid operator and large cap E&P company, however the stock is hard to buy at current levels given its in line valuation. That said, on a pullback it looks attractive and even at the current price it is a marginal buy. However, a company like Apache Corp (NYSE: APA) that trades at a discount to peers and is more of a turnaround story is more interesting at this point in time. Apache is focused on improved returns from its Permian holdings and showing progress towards this could drive those shares higher. For EOG, it is harder to find a catalyst to drive the stock higher currently. John has seven years of experience as an equity analyst following various stocks and sectors. As a senior equity analyst, he received awards from the Wall Street Journal and Financial Times for his writing.